ARIS Secures Your SAP Investments! To secure your SAP investments, ARIS supports the API of the new SAP® Solution Manager 7.2. With its new release, SAP offered with Solution Manager 7.2 SP 3 an open API for data exchange. Securing classical ARIS for SAP®Solutions capabilities and leveraging new ones, ARIS supports this API. Software AG plans to deliver a dedicated service release directly after SAP releases so that you can profit from a smooth transition. A pre-release version of ARIS for SAP Solutions was released in November 2016. This version supports SAP’s Solution Manager 7.2 SP 3 and specifically addresses early adopters of SAP Solution Manager 7.2. It provides synchronization and migration functionalities in ARIS. Important Note: To offer a timely availability after SAP‘s release, there are some technical restrictions due to which the usage of this early adopter version in combination with the ARIS October release (ARIS 9.8 SR 6) is not be possible within one ARIS installation. Nevertheless, this restriction will be resolved by ARIS 9.8 SR 7. ARIS 9.8 SR 7, which was released in December 2016 , includes all ARIS Test Designer capabilities for SAP Solution Manager 7.2 as well as additional new functionalities such as diagram transfers from ARIS to Solution Manager. Pls. note that from ARIS 9.8 SR6, ARIS Test Designer is available as an own extension pack for ARIS Designer. Please mind the following: If you plan to migrate to the new Solution Manager version, please migrate your ARIS project with the script-based migration procedure, which will be available in both versions, before making any changes in the migrated SAP project. ARIS remains the TOOL OF CHOICE for your SAP solutions as it benefits from Software AG’s strong experience in SAP projects and long-lasting relationships on the BPA and SAP market. Further ARIS connected timeline will offer you a smooth migration path and investment security. If you do plan to move to SAP Solution Manager 7.2 SP3 or if you have any further questions, please do not hesitate to get in touch with your local Software AG contacts. We will keep your up-to-date and share the latest information with you here. Stay tuned! In our company, ARIS is the master for the business processes and we sync from ARIS to SOLMAN and not from SOLMAN to ARIS. The picture above only show the SOLMAN to ARIS sync. 1. Will it be possible with the new versions to still sync from ARIS to SOLMAN? 2. Will the upgrades have an impact on current projects where we are already syncing the processes and SAP IDs were already allocated? Sure, it will still be possible to synchronize in both directions as it was before. The procedure shown above is only relevant for the initial migration of your previous ARIS projects that are already synchronized with Solution Manager 7.1. During the migration, your SAP IDs will be re-allocated to the migrated project. So, you can continue to work with your projects after the migration. Based on this article I understood that sync with Solution Manager 7.2 will be available only starting from SR7, correct? What is the goal of SR6 in this case (in terms of supportability Solution Manager 7.2)? The synchronization with Solution Manager 7.2 is already available with our Early Adopter Version, which was released today. The Early Adopter Version of ARIS for SAP® Solution Manager 7.2 Support (ARIS 98.5.2.1118153) has been released. If you are interested in using this Early Adopter Version please send me a short email, since a password is required for downloading. The recommended procedure how to migrate existing ARIS projects to support SAP® Solution Manager 7.2 is described in the document “Early adopters version SAP® migration description.pdf”. Technical restriction: A simultaneous usage of the Early Adopter Version in combination with the ARIS October release (ARIS 9.8 SR 6) will not be possible within one ARIS installation. Functional restriction: Existing customers using ARIS Test Designer projects will not be able to migrate their projects with the Early Adopter Version, since Test Designer projects will only be supported with a later version. This Early Adopter Version also provides only limited change control support with SAP Solution Manager 7.2. Maintenance restriction: This Early Adopter Version will not be maintained. Thus, customers have to migrate to ARIS 9.8 SR 7 which will be maintained as to common ARIS practices. 1. When is the SR7 going to be release? Is it Dec 16 or Dec 17 ? 2. Will this SR7 be backward compatible with older SAP Solution Manager? I have 2 parallel projects in different phases of their lifecycle on one ARIS server instance. One project is synced to SAP Solution Manager 7.1 and the second one will be synced to SAP Solution Manager 7.2. SR7 is going to be released in Dec 16; it is actually planned for this week. So "December 2017" was just a mistake in the initial post. Yes, SR7 is fully backward compatible to SAP Solution Manager 7.1, i.e. you can manage projects of SolMan 7.1 and 7.2 within one ARIS installation. Thank you that sounds very promising ! Our company is currently using the interface to SAP Solution Manager 7.1 and we´re planing to upgrade the SAP Solution Manager to 7.2. 1. If we do the content activation on the SAP Solution Manager side, does the interface automatically map the new processes and new process-steps that are generated during content activation with the corresponding ARIS-models that hasn´t been changed in 7.2? 3. Is there any document, that describes the necessary steps for content activation , when using the ARIS-interface? has no one here an idea or experience from the practice? Please apologize my delayed replay. We provide a script-based migration approach that allows you to map existing projects, which are synchronized with SAP Solution Manager 7.1, to the new structure in version 7.2 of Solution Manager. The required migration steps are sketched in the figure attached to the initial post (please see http://www.ariscommunity.com/system/files/images/ARIS_SAP7_2_migrationpath.png). A more detailed documentation is provided in the ARIS help content of each ARIS version supporting Solution Manager 7.2, which is currently ARIS 9.8 Service Release 7. There are no dedicated preparation steps required on the SAP Solution Manager side. What are the best practices to perform such activities and how long it would take? Is there any guide that shows information on how to do it ? Is there any tool to perform this kind of activities ? Upgrade your ARIS 9.6 server to ARIS 9.8 SR7. Observe all the release notes on upgrading ARIS Servers and the ARIS Server Administration and Installation guide. Which version of ARIS supports synchronization with SAP Solution Manager 7.2? 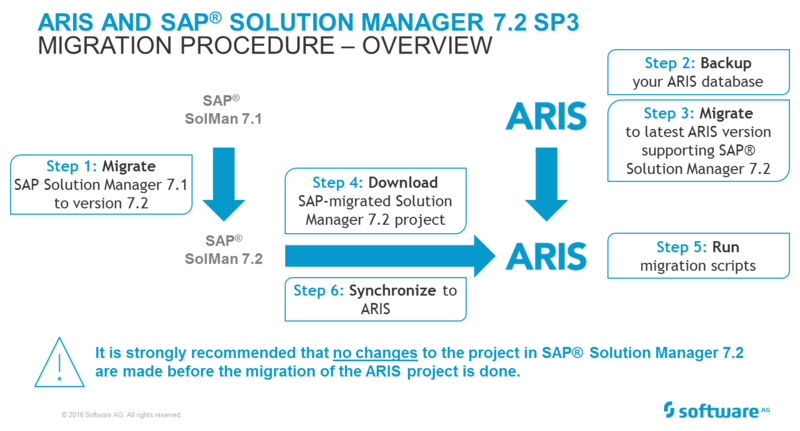 Where can I download the instruction on the integration of ARIS and SAP Soluition Manager 7.2? I have a client currently using the synchronization ARIS 9 SR7 with SolMan 7.1. As the systems are in different network, we are using the SAP Router for communication. Now the client is moving for SolMan 7.2, but ARIS 9 SR7 Administration Module is not allowing anymore to add the router string to connect with SolMan 7.2. There is no plan to migrate ARIS and SAP environments for the same infrastructure (not in a close future). How should I proceed in this case? Is it possible to continue connecting ARIS through SAP Router for SolMan 7.2?